Born in La Sarre, Quebec in 1956, Alain Lévesque was trained in graphic arts at the Université du Québec in Montreal in the 1980s. Launching his career in graphic arts and design, he won the Montreal World Film Festival poster design competition for five years. During that same period Alain created stunning posters for the Americas Cycling Grand Prix and for the exhibit The 1920s: Age of Metropolis at the Montreal Museum of Fine Arts. His art has been published in leading reference works including the Zurich-based Graphis Poster. Lévesque’s fascination with automobiles began in 1988 after exposure to vehicles from the 1920s and 1930s, whose forms inspired him. Up to 1999, he worked in acrylic and gouache, but then started painting with oils, in much larger sizes. The unmistakable style of Alain Lévesque is a conscious revival of several European art movements from the early 20th century such as Cubism, Italian Futurism and Bauhaus. From these influences he has developed a distinctive, abstract interpretation of cars that is unique in automotive art. "That my work appears as a total abstraction does not bother me, as long as it is able to communicate an idea. The automobile becomes a pretext to create. My goal is to convey the essence of the automobile, not to illustrate it." Since 1995, Alain has been a regular guest at the Meadow Brook Concours d'Elegance in Michigan, where he has won numerous numerous trophies and awards. In 2001, he was chosen to create the trademark image for this event, held at the DaimlerChrysler Tech Center. 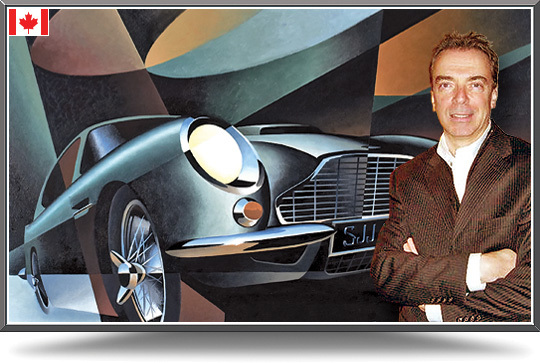 In 1997 he exhibited at the prestigious Pebble Beach Concours d'Elegance as a guest of the Automotive Fine Arts Society, becoming a member for two years. Lévesque's work has been featured internationally in car enthusiast magazines, including the British Octane and Classic and Sports Car, the French Automobile Classique and Le Monde de l'Auto, and the American Automobile Quarterly and Auto Aficionado. Collectors include Jerry Seinfeld and Pink Floyd's Nick Mason. Commission Alain to create a unique painting for you! For more information, see the artist's catalog.